Automotive network technologies such as FlexRay present a cost-optimized structure in order to tailor the system to the required functionalities and to the environment. The space exploration for optimization of single components (cable, transceiver, communication controller, middleware, application) as well as the integration of these components (e.g. selection of the topology) are complex activities that can be efficiently supported by means of simulation. The main challenge while simulating communication architectures is to efficiently integrate the heterogeneous models in order to obtain accurate results for a relevant operation time of the system. In this work, a run-time model switching method is introduced for the holistic simulation of FlexRay networks. 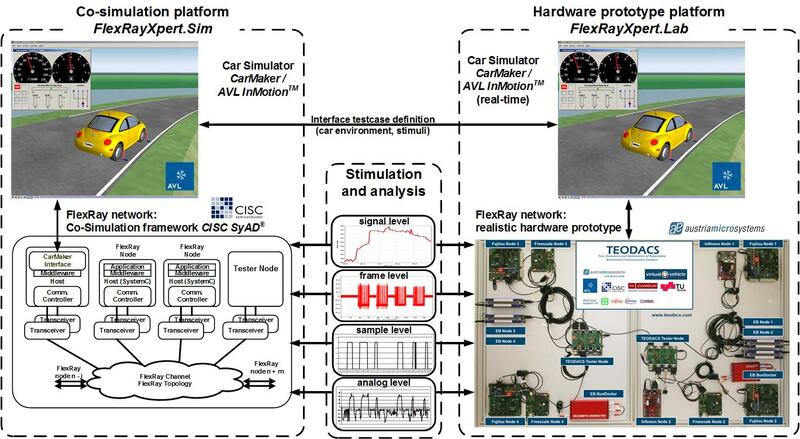 This cross-domain simulation platform is used within our TEODACS project (Test, Evaluation and Optimization of Dependable Automotive Communication Systems. The focus of this research project is set to the analysis of the communication architecture and the influence of this component to the distributed system. To that aim, we propose a co-simulation platform tightly interfaced to a realistic prototype for the in-depth analysis of FlexRay networks. CarMaker/AVL InMotion simulates a powertrain system (road, driver, control loops for vehicle dynamics) and generates a realistic bus traffic for the network. SyAD provides a co-simulation framework for the seamless modeling and integration of the different microelectronics components (e.g. cable model, bus drivers, middleware, software functions). Based on a Drive-by-Wire use case, we evaluate the benefits of the proposed cross-domain co-simulation approach for the early analysis and verification of the assembled system.